Tonight I would like to feature Larry Seiler. Larry is an amazing plein air artist living in northern Wisconsin. He has won many awards for his paintings. His style ranges from quite realistic and precise to a more loose and painterly approach, as in the painting below. 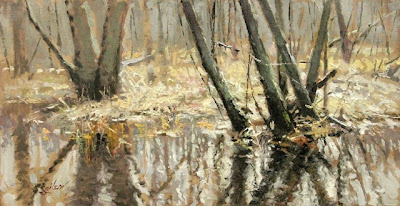 This painting, titled Flooded Timbers, 10 by 20, oil on linen, is actually one of his studio paintings rather than a plein air work. I have chosen to present it here because I think that the way he establishes a focal point of interest in this painting is compelling. His use of light is masterful. As in all of his works, he demonstrates great control of his brush strokes to create a very effective image of what he sees. He maintains both a painting website at larryseiler.com and a blog. Check them out to view his many landscapes, portraits, and examples of wildlife art. Of course, I love the landscapes the most. This morning as we sat down to breakfast, the radio was on and the man being interviewed was speaking earnestly about some fragment of military history. Of course he was. Tomorrow is Remembrance Day, and so for the last week or two there have been programs on a military history theme every day on the radio. The local newspaper included a supplement on remembering our veterans, and the local museum has scheduled an exhibition and talks on military history as part of its annual program. Remembrance Day has been observed in commonwealth countries since the end of World War I to commemorate the signing of the armistice on the eleventh hour of the eleventh day in the eleventh month of 1918, and to remember the soldiers who died in the Great War. Although WWI ended 95 years ago, we continue to mark the date every year on the anniversary of the end of that war. There are very few people alive today who were born prior to the end of World War I, and those few would have been too young during 1914-1918 to remember the war. So Remembrance Day has become something other than what it was originally declared for -- kind of an all-purpose day to think about the experience or death of any westerner who has fought in any war, or even just to give airtime to military topics in general. This got me to thinking about what kinds of things we make cultural space for. Every morning I awake to news, weather, and sports on my radio alarm clock. These three topics are repeated in considerable detail every half hour. The other topic that is part of this repeating sequence is a traffic report describing the delays and accidents of the morning in the large city where the program is broadcast (but which is not the place that I live). How was it decided that news, weather, sports, and someone else's traffic are what listeners want to hear? I know for sure that I am not interested in hearing the sports report. I enjoy doing sports, especially things like skiing, cycling, and hiking, but I am not at all interested in watching or hearing updates on men's professional football, hockey, baseball, or basketball. What I would enjoy hearing each morning would be a report or story on something food-related. By this, I don't just mean restaurant reviews, although that could be an occasional focus. There are so many interesting food topics they could talk about: a recipe for something, such as creme brûlée; interesting travel and food topics, such as why the Portuguese love bacalao; vegetable gardening tips; or health related food facts, such as the health impact of excessive salt ingested in prepared foods. Another topic area that would be or great interest to me would be just about anything on a health theme. Or human development and learning. Or books, especially fiction, or writers. Or interesting facts about other cultures. We all eat every day. Many of us spend considerable time planning, shopping for, preparing, and eating meals every week. Everybody has health related incidents and concerns in life, whether it is breaking a bone, an interest in being fit, raising healthy children, or coping with chronic illness. How is it that hese topics that would be useful and of interest to most people do not get cultural airtime, and yet the weather (which we can find out about in an instant on our mobile devices) and sports reports are privileged? In the seasonal cycle, Christmas is certainly the cultural event that takes up the greatest time, attention, and money, but we also make space for Valentine's Day, Halloween, Mothers' Day, and so forth. Is it that we value these days and topics more than any other? Is it simply commercial, in the sense that whatever sells the most or is most likely to get listeners to tune in or readers to buy the newspaper or magazine (and therefore be exposed to the ads) has become the fabric of our culture? Or is some of it just laziness or habit: once we have created a specific cultural date, event, or practice, it goes on and on long past being meaningful because it has become part of the routine unexamined rut of our cultural life? Recently I watched a TED talk by Graham Hill on down-sizing. He suggested that we in the developed world have too much stuff, and that the effort of collecting and managing all that stuff makes us unhappy. His view is that if we were to simplify our lives by getting rid of most of our material goods and keeping only a few really excellent items, this would free up time to engage in doing things we like to do. As well, we could move into much smaller living spaces, thus reducing our environmental footprint. This is a seductive argument. How much time do you spend looking for some specific item out in the shed, or in the basement storage room, or maybe it's in the workshop? This happened to me last weekend. We were going to go for a mountain hike, and I was looking for my mid-weight hiking boots. I couldn't find them in any of the places that we keep footwear. Apparently, they were never unpacked after our last move. Rather than tackling the wall of boxes in the storage room, I just wore my old run down light-weight hikers. What good is it to have stuff that we can't find and therefore don't use? And then there is all the time we spend cleaning and looking after the great big houses we have in order to hold all of our stuff. But, the fact is, we love our stuff. I am going to talk about three reasons that we love our stuff. We feel pleasure when we obtain new things. Second, our sense of identity is entangled in the way we represent ourselves to the world via our materiality. A third reason that we love our stuff is because of the memories signified by each object that we surround ourselves with. Each of these points demands a chapter rather than a mere paragraph or two, but I will try to keep my examples brief. It might be better to give than to receive, but in our materialistic culture, we do enjoy "getting" very much. For many people, shopping is a favourite pastime, and one of the ways that they spend much of their leisure time. There is an internal surge of pleasure upon purchasing a new item. Perhaps we picture ourselves using that brand new pair of powder skis on the ski hill and feel the anticipated pleasure of skiing. The object that we purchase is pregnant with possibility; we picture how it will enable us to engage in new activities, projects, or social interactions. Or we imagine wearing the new maroon polka dot pajamas and curling up on the couch in front of the fire. The purchase of the pajamas stands for comfort and self care. When we purchase something, we are acting upon the internal message, I am worth it; I matter. In this, we might be pawns of the marketeers in our capitalistic culture, but the source of the belief does not make it any less potent. Receiving a gift conveys a similar message. You matter. I care about you. The object that one purchases or receives as a gift represents caring, and the notion that one is valued as a person. Our stuff also comes to represent our identity. The kind of car that we drive, house that we live in, clothing that we wear, or coffee maker that we own tells the world who we are. If I drive a four wheel drive pickup truck, I am saying to the world that I am a certain kind of person, and that is a different kind of person than someone who would drive a BMW, let's say, or a Smart Car. Clothing is a particularly important signifier of identity in our culture. Part of being culturally competent is to be able to read the nuances of dress and what it represents, and also to be able to select one's own style of dress to appropriately indicate role, class, gender, and personality. At one of the places I have worked, the men in leadership roles wear sports jackets, dress shirts, slacks, and ties, and in some cases suits. Except on Fridays. On Fridays, to a man, they appear at work in blue jeans and polo shirts. In order to participate in this particular work culture, these men have to purchase items of clothing that will give the message that: I am one of the guys. I fit into this team. At the same time, there has to be a small individual twist that says: I'm Fred, not Jack. They would not want to look like copy cats or clones. That would send the wrong message about competence and identity. This matter of materiality as a representation of personal identity has come to pervade every aspect of mainstream North American life. We spend a great deal of time managing our representation of self to the world via the things we own and use. Moreover, we change our representations of self as our life circumstances change. For example, when I think of the houses that I have lived in and owned throughout my life, each one has sent a different message about identity. I'll list them here, sequentially: 1. Renovated little brick heritage house in the shabby urban core (funky, young urban professional); 2. Three bedroom wooden split level in a suburb way on the outskirts of a large city (young family starting out, grad student); 3. Two story five bedroom home in a middle class suburb of a smallish northern city (growing family, middle class, northerner); 4. Log house with stained glass windows on half an acre with dog (artist, writer, intellectual, northerner); 5. Sprawling 60's split level in established middle class neighbourhood of a mid-sized city (late middle-aged, executive/professional). As my work role, family status, and geographical location have changed and along with them my preoccupations and activities, my type of home has changed as well for functional reasons. However, the type of house I live in also presents a message about who I am. A third reason why we care so much about our stuff is that the objects that we have become vehicles for our memories. When I look at the row of ornaments, vases, and pottery objects lined up on the mantelpiece in my living room, I can remember how each of those objects came to me. For example, from left to right: a vase handmade in my hometown that was a gift from my brothers when I was awarded tenure; a yellow and blue pottery container made by my daughter, the artist, when she was a teenager; a hand blown pink glass vase that was a gift from a brother and his ex when they lived in an artist's community; a robin's egg blue small pottery vase from the town where my former in-laws live, and so forth. The objects that we surround ourselves with resonate with memories of the things that we have done in life and the people who have been important to us. Sometimes those objects represent significant accomplishments, turning points, or watershed moments in our lives, such as the births of our children, earning a degree, a divorce, or a new job. But even the most mundane objects may be saturated with memories. I keep a small basket of rags in the laundry room. I have cut up old pieces of discarded clothing and towels to make the rags. When I pick up each scrap of fabric, I remember where it came from. This was that awful baggy old grey T-shirt of Rob's that I sneaked out of his drawer and made into rags so he wouldn't persist in wearing it. This rag came from my Monet T-shirt that I bought at an art gallery exhibition in Montreal in 1998. This next rag in the pile was cut from the worn-out sweat pants that I bought when I was pregnant with my second child. This scrap of towel was cut from a set of towels given to me by my beloved Aunt Mabel who died thirty years ago. Touching the fabric gives each memory an immediacy. The Monet T-shirt takes me back to memories of the conference I attended in Montreal, the people who were there with me, my parents who looked after my children while I was away from home, the events occurring in my social circle, and a sense of the texture of my life during that period of time. Because the objects in our lives hold memories, it is hard to throw them away, no matter how shabby they have become, or how little we now make use of them. Would the stories disappear if we threw the objects away and edited the pile of stuff down to a more manageable level? Perhaps not. But the act of viewing and using many of those objects provides connectivity to the past and helps to create a sense of continuity in our life story. Our stuff offers life possibilities as we acquire it, signifies that we are of value as individuals, represents aspects of our identity, and holds our memories. That is why we love our stuff.